I don’t know of anyone who takes the selection of his or her birthday cake so seriously, but I respect my son for this trait. It’s a big decision, to be sure. Chocolate or vanilla? Buttercream frosting or cream cheese? Ice cream on the side or not at all? Or perhaps an ice cream cake? So many choices to choose from. We’ve been in birthday cake negotiations for weeks now. I offered up the easy-for-Mom and always-crowd-pleasing Publix birthday cake. Publix cake is usually a no brainer. Everyone loves that cake. Oliver, though, thinks it’s too sweet. He’s right. It is too sweet, but this usually isn’t a problem for most of us. We eat it, feel guilty, maybe add in an extra workout or neighborhood walk, then sneak a second slice when no one is looking. Oliver never finishes a slice. He’s the smart one in this household. The weekend before we were to celebrate his birthday, I offered up three of my baking books for him to peruse and make a selection from. One had few pictures, so he wasted minimal time on that book. In the other two books, he placed sticky notes on the photos he thought looked interesting and “not too sweet,” though I’m not sure how he made this judgement based on photos. 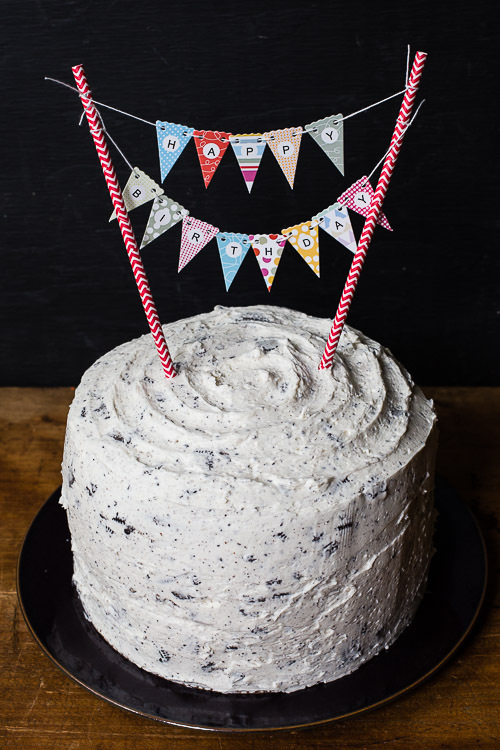 Ultimately, he walked away with one cake in mind – the cookies and cream cake from page 107 of Tessa Huff’s Layered: Baking, Building, and Styling Spectacular Cakes. His only condition was that he wanted the Swiss meringue buttercream frosting from page 41 rather than the white chocolate-cream cheese frosting the recipe called for. He definitely wanted the Oreos in it, though. I walked out of the parking garage at work and headed toward the cancer hospital. It was a Saturday morning of the long weekend, and team rounds were scheduled to begin in about fifteen minutes. The parking garage is not my usual one. This one is closer to the hospital, and on weekends, I won’t get a ticket for parking there. When I’m on service in the hospital – two weeks straight as the attending of the oncology inpatient unit and the oncology consult service, 24 hour-per-day call – this small thing feels like a luxury. A few less steps to take to get in to the hospital, a few less steps to take when I’m headed home to my family. Nestled between my weekend parking garage and the hospital is the nursing home where my dad lived for the last year of his life. I hate that place. When I think back on the trauma I experienced with the loss of my father to dementia, the nursing home plays a starring role in my memories. I park in that parking garage less than two dozen times per year, only when I’m on service. Usually, on my way to the hospital or back to my car, I find myself holding my breath as I walk by the nursing home. Sometimes I cut through the parking lot, taking care not to trip on the tree roots that have buckled the asphalt. Other times, I give the place a wide berth. Even without stepping foot inside, I can remember the smell of it. If I allow my mind to wander, I can feel the black memories beginning to return, squeezing the breath out of my chest. So I hold my breath, quicken my pace, and think about my team and the patients waiting on me. Go, I tell myself. Walk faster. This Saturday was different. As I neared the path that cuts through the nursing home parking lot, I realized something was different. A chain-link construction fence blocked the way. I walked several steps more, then stopped. It’s gone, I thought. I turned back and walked back to an opening in the fence to get a closer look. It’s finally gone. The nursing home had been bulldozed. My ever-expanding hospital bought the property several months ago, and though I’d hoped that one day this would happen, the nursing home remained. Until now. In the bare construction site, near a construction dumpster, only a single large oak tree remained. 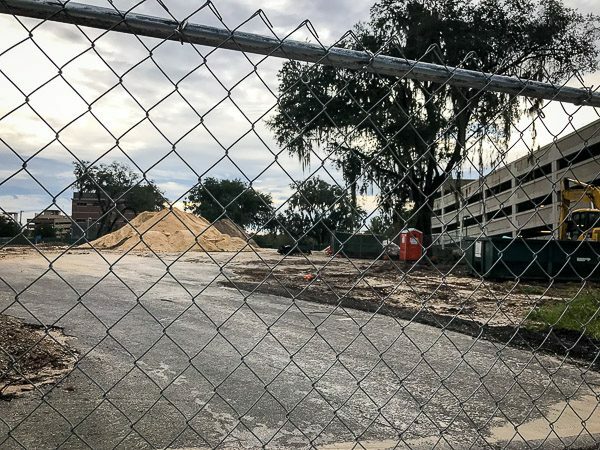 That oak tree had provided shade over the depressing back patio of the nursing home, where a handful of wheelchair-bound patients sat outside and smoked. I took a deep breath and felt a wave of relief wash over me. I raised my phone and took a photo. I needed the evidence. I looked down at the photo of the empty lot, smiled to myself, and walked the rest of the way to the cancer hospital. I’ve looked at that photo several times since then, and I find it reassuring and comforting each time. That awful place has been torn down, and it feels wonderful to have the ugly reminder of a year’s worth of pain and some of the worst memories of my life gone, completely erased. Alaska came up as a vacation idea last summer, during our day of travel home from Paris. We’d just spent nearly two weeks overseas, the first half in London and the second half in Paris. I was impressed with how well my vacation-averse husband fared during the trip and, feeling optimistic, I suggested that we begin thinking of our next summer vacation. Somewhere else in Europe, maybe? Ireland or Scotland? Knowing my husband as well as I do, I knew that he was imagining how much less expensive a domestic trip would be. I’m not quite sure why he thought Alaska would be less expensive than a European trip, but I chalked it up to the after effects of consuming a small country’s worth of wine, cheese, and pastries over the previous week in Paris. I took his suggestion and ran with it. Both of our parents had visited Alaska by cruise, and they all loved their experience. 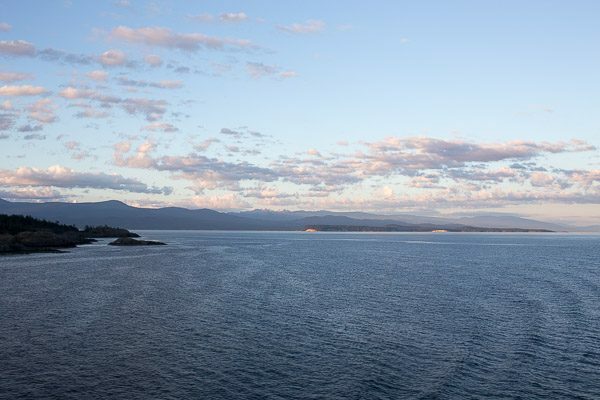 I felt relatively indifferent about an Alaskan cruise, but when I investigated how we could best tour the state, it seemed that a cruise made the most sense. I wanted to see the Inside Passage and Glacier Bay National Park, and the most feasible way of doing so was by ship. I also wanted us to have the flexibility of touring on our own, though, so at the end of the cruise itinerary, we would plan to rent a car and explore on our own. 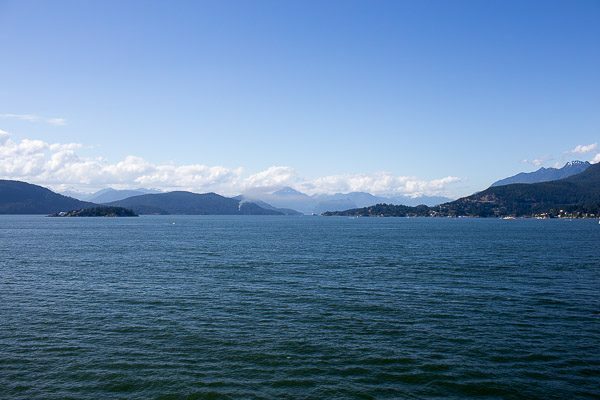 On July 2nd, we boarded our cruise ship – Holland America’s ms Noordam – at the port in Vancouver and soon departed for a north-bound trip up the Inside Passage, headed for Seward, Alaska. 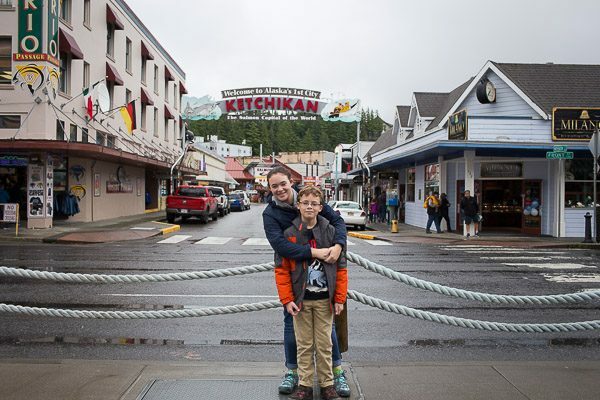 After a full day of cruising, we awoke on the third morning of the cruise to our first port, Ketchikan. 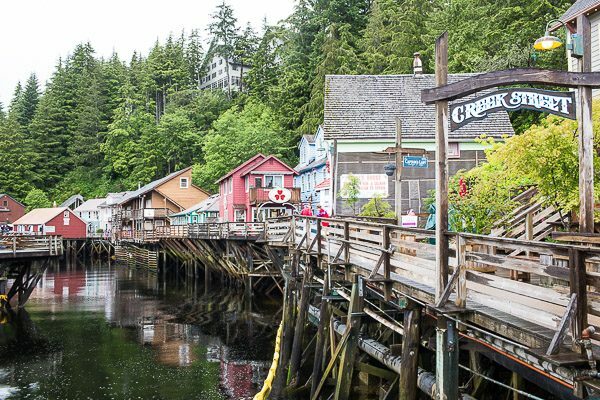 We spent the morning wandering around the town, exploring the shops along Creek Street, and generally wandering aimlessly. It was the 4th of July, and the town prepared for their annual parade, to be held around noon. We had other plans, though. A floatplane awaited us, and with Captain Randy at the helm, our family of four and another young couple were treated to amazing views of the waters and mountains surrounding Ketchikan. We flew through the Misty Fjords National Monument, admiring waterfalls, thick evergreen forests, winding waterways, and scattered islands. We landed on a lake somewhere in the middle of the wilderness and the silence and stillness of the place were incredible. For the rest of our trip, Oliver talked about his strong need to own a floatplane one day.